This year I made it a point to look for overnight spots that will be good places for my Prius. While I was driving to Cottonwood / Jerome I did just that. 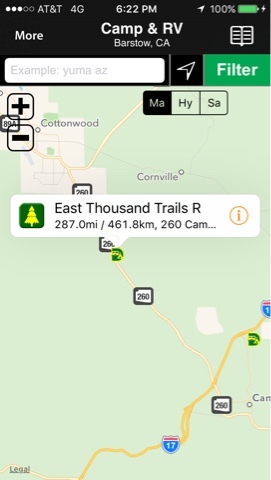 The first, above "East Thousand Trails" is easy to spot from AZ260 with campers visible from the road. The dirt road off of AZ260 is well maintained with a large space to park on either side of the entrance road. The spot on the left had a Class A parked in it. These two spots would pick up a lot of road noise but in the dark they are easy to find. You drive a short distance and you take a left and there is a good size spot on the corner that was open. On this road to the left there are a couple side pullouts one with a vehicle towing a small trailer. Then on the left there is a larger area where it looked very full, all with large rigs. They are close enough to best be considered friends. Even further down this side road are other random spots. Overall a good place to go for the night and the road is in very good shape for being dirt. This is dry camping as there are no services and appears to be popular as the temperatures get higher further south. About a half mile further toward Cottonwood is another spot listed called Verde River Scenic Area". This is a dead end road to the river with a parking lot at the bottom of a steep washboard hill right after getting off AZ260. There was no one there and it would be fine for me to camp but the road is rough down/up the hill and I wouldn't want to be down there in the rain. I needed to use both sides of the dirt road no to bottom out. There is a third option that AllStays does not list. Directly across from the entrance of East Thousand Trails is another dirt road to what appears to be federal land. The entrance over the cattle guard was fine but the dirt road after that is for high clearance vehicles only. I could see a couple rigs out there some distance. Actually when you get over the cattle guard you are ok but close to the highway. The dirt road splits going straight and avspurt on the right. I could not explore these with my Prius. With my Prius I can generally find a place to stay as im small but I have to be so careful to not get hung up on bad roads. Wonder if you have looked at The Ultimate Public Campgrounds Project (www.ultimatecampgrounds.com)? It has LOTS of boondocking spots. Apps for Android and iOS are available. Thanks for the reminder about the UltimateCampgrounds.com. I was aware of the app for some time and haddent downloaded the app to try it out.